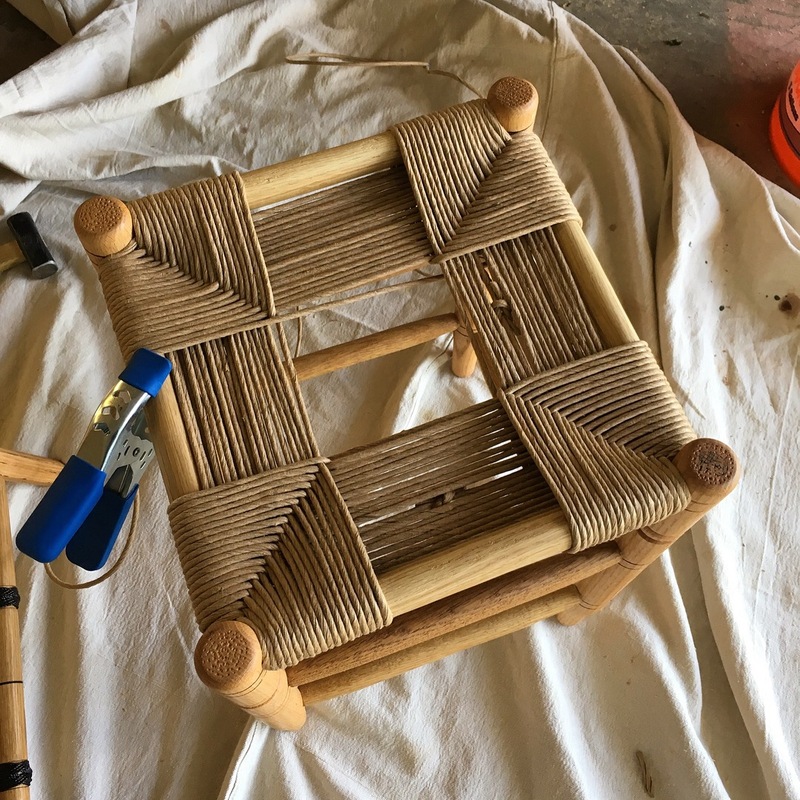 Now that the stools were assembled, it was time to tackle the seat weaving. …to understand the weaving process I read through the articles on Ms. Peters’ site, bought a small booklet on the subject and watched a bunch on YouTube videos. The most helpful video, by far, was Ed Hammond’s (peerlessrattan.com) video. Having prepared as much as I could, there was nothing left to do but jump in and do it. So I gathered my supplies and tools and settled in for a long afternoon. 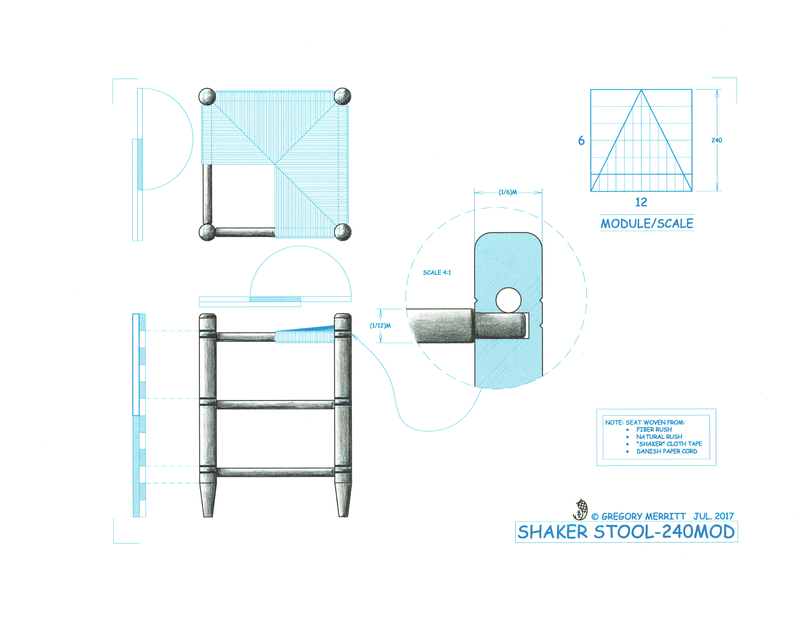 The pattern is a simple over-under and progresses counter-clockwise around the stool. While the pattern is simple, the nuances that are the hallmarks of skill and proficiency are not. As with most hings handwork, these must be earned with time on task. Where to push and where to pull? How hard? 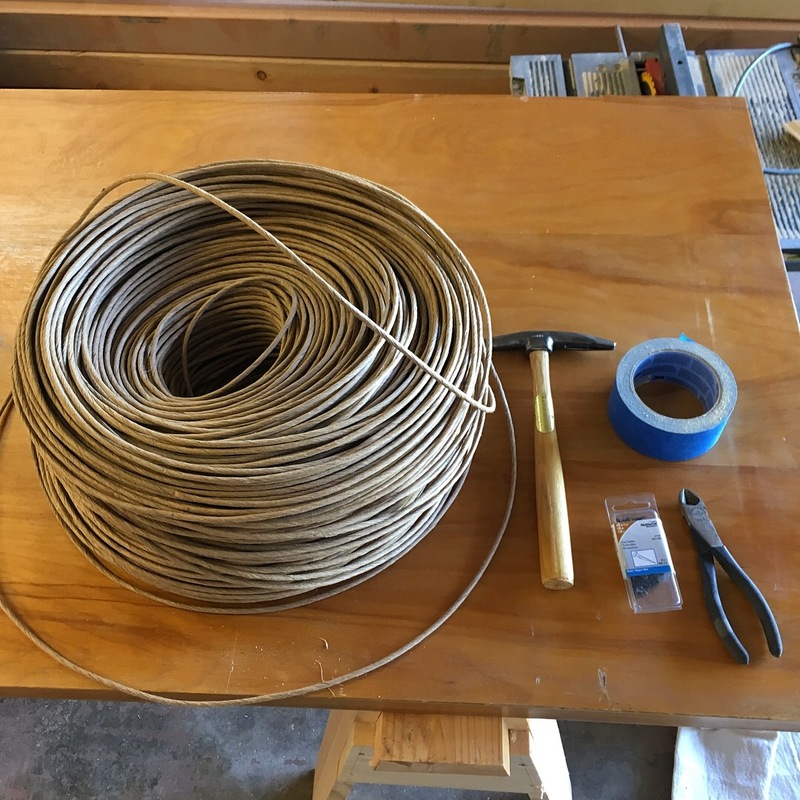 How large a coil of material can I work with? On and on. The thing that I struggled with the most is how to handle and turn the coil as I weaved. The loose coil of rush must be continually rotated, in the correct direction, else the strand will untwist and leave you with a string of flat paper. I fought this all afternoon! Constantly having to stop and re-twist the strand. There is a rhythm that began to reveal itself as the afternoon wore on and I became more and more comfortable with the process. Over the rail, up through the middle…over the rail up through the middle. Even so, my progress was clumsy at best, but I managed to get the first seat completed. This first seat is presentable and I’m confident that the next one will improve in both execution and speed. This first round of weaving took me six hours! I also woefully underestimated how hard this process would be on my fingers. My thumbs and index fingers are raw and sore. So either tape or gloves will be needed for the weaving of the next seat. 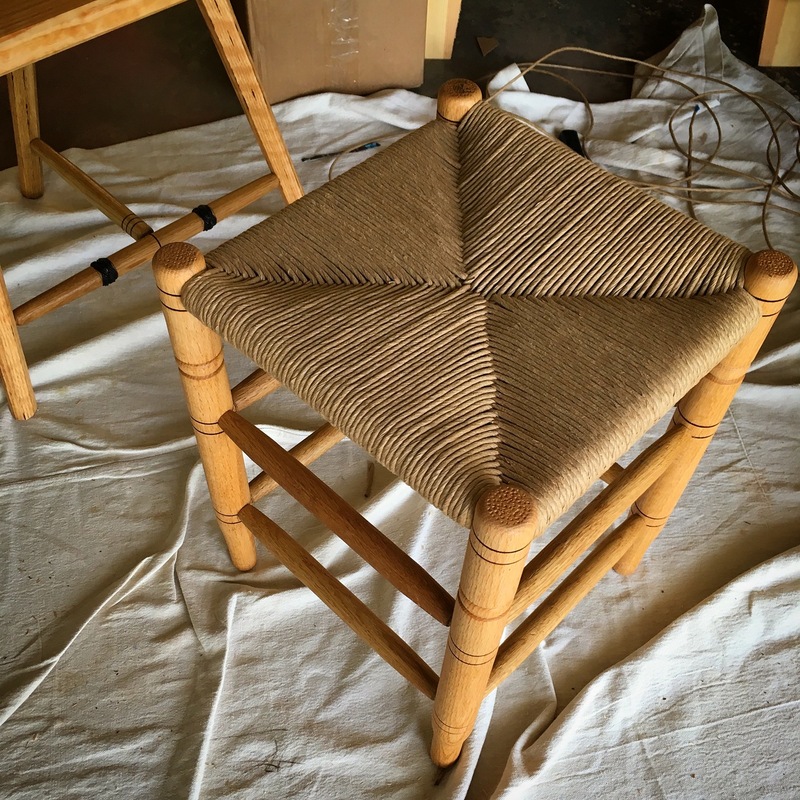 This entry was posted in Shaker Stool 240 Mod and tagged fibre rush, seat weaving. Bookmark the permalink. Wow! Really great, Greg. I’ve been wondering how this was done. I’ve seen books at the library on caning and I hope someday to have the need for it. Where did you get the caning material – the rush? Hey thanks Matt! I ordered my fibre rush from https://hhperkins.com. The shipping was quick and the product seems consistent throughout the bundle. Hope you come up with a reason to give it a try. Thanks Salko. I’m slowly figuring it out. Very nice! I wondered how that was done. Thank you Derek. Nothing too difficult. You should give it a go. The stools look a lot like a chair called the J39 shaker chair designed by Børge Mogensen. But then again his chairs are also inspired by the Shakers. Thanks Jonas. I do like that chair and have toyed with the idea of giving it a try. The Shakers have influenced folks far and wide. You’re more then just OK on to this job! Its great! Thanks Antonio!…and thanks for the links. Both have some great information. Greg these have shaped up beautifully! They’re going to be a joy to use. Thank you Brian. Hopefully they will see years of use.